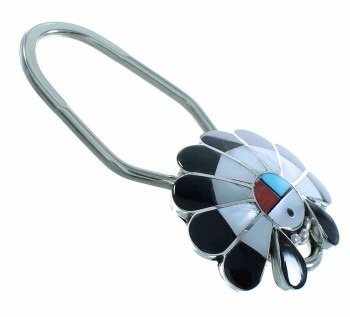 Sterling silver, real Turquoise, Coral, Brown Shell, Jet, and Mother of Pearl. 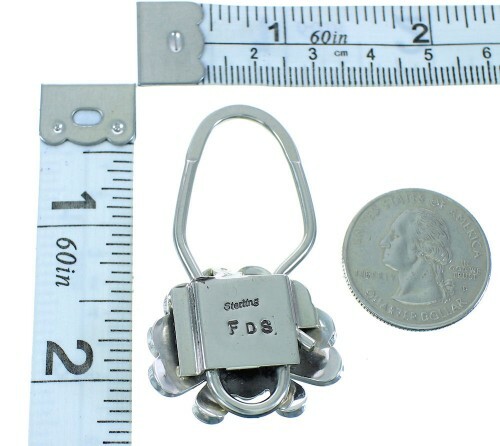 Key chain measures approximately 2-1/8" long (including ring) and 1-1/8" at widest point. There is nothing at all average about this beautiful key chain! 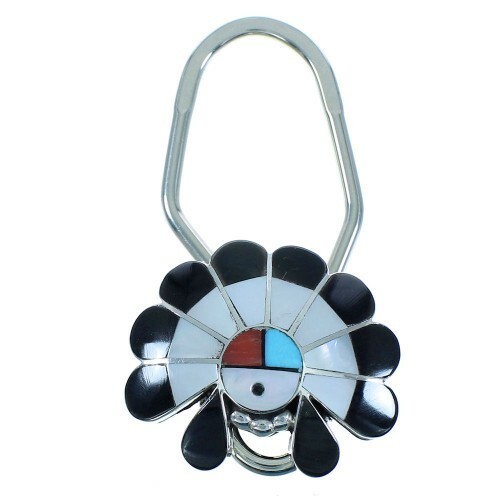 This piece of Native American jewelry is Zuni hand crafted by artist Fredrick & Denise Suitza, out of genuine sterling silver and real multicolor inlay. The inlay consists of: Turquoise, Coral, Brown Shell, Jet, and Mother of Pearl. The inlay is gently set, while thin silver lines and mini silver beads can be seen creating a remarkable Chief Headdress design for an amazing look. For extra strength and durability certain parts of the key ring are made out of nickel. The key chain is stamped sterling and hallmarked.